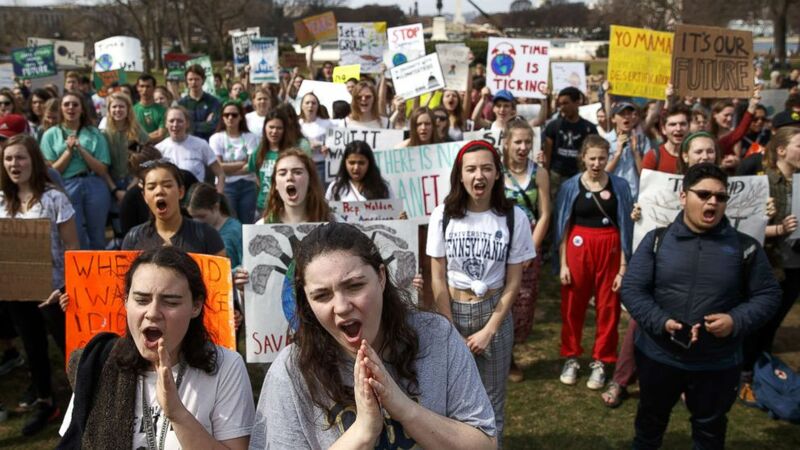 Student-led protests kicked off around the world Friday, with thousands of young people skipping school, calling for action on climate change. "Today is the where elected officials all over the world will hear our voice," said 16-year-old Nadia Nazar, a march organizer, said in front of the U.S. Capitol. The student "strikes" and other events were scheduled to take place in more than 100 countries, spanning from Australia to France to the United States, with some students protesting outside of their schools to others marching in the streets. Using the hashtag #FridaysForFuture, the organizers said they hoped to bring national attention to what they say needs to be done to stop climate change. The protests were inspired by the Swedish teenager named Greta Thunberg, who has now been nominated for the Nobel Peace Prize. Last September, she began a solo protest outside of the Swedish Parliament that led to her heading a climate change march of thousands of students through Brussels. Her movement inspired the organizers of the #FridaysforFuture, one of whom is Isra Hirsi, the 16-year-old daughter of controversial freshman Democrat Rep. Ilhan Omar, D-Minn. They took part the protest in Washington, D.C.
"We have 11 years to avoid a catastrophic climate change," said Hirsi. "That's why we are striking today. The youth hereby declare a national emergency on climate change." Omar says she shares the same passion as her daughter for action on climate change, which has helped propel the Green New Deal onto the national stage. She spoke directly to the young people in crowd about what she called the "greatest threat humanity has ever faced" and the responsibility the United States has in combatting climate change. "As lawmakers in one of the wealthiest countries in the world, we must acknowledge that we are responsible for nearly a third of the access of carbon dioxide in the atmosphere today," Omar said. "And thus we must bear responsibility for climate change in any other country in the world." Omar also took the time to call out President Trump and his administration's stance on climate change. "We must not let the current administration prioritize corporate interests over the health of our communities," said Omar. The Green New Deal is a wide-reaching initiative that its supporters say aims to transform the economy to combat the issues of climate change and inequality. The proposal would call for the U.S. economy to depend solely on renewable energy by 2030 as well as investments in the nations education, infrastructure and health care systems. Hirsi echoed the words of her mother in support of the Green New Deal and urged young voters in 2020 to support candidates who will back the initiative. "Vote for people who believe that 100 percent renewable energy by 2030 is possible and are determined to make it happen," said Hirsi. "People who know that fossil fuels are a thing of the past and that the future is renewable energy."